happy mardi gras/fat tuesday/fausnaught day! 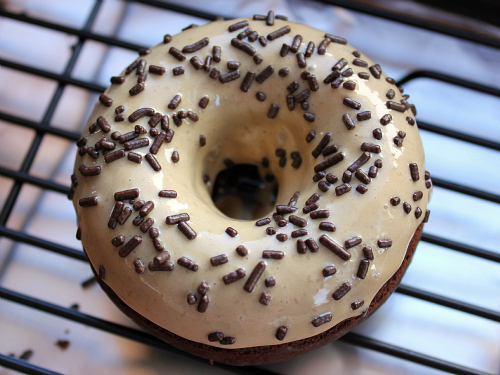 whatever you call it, i won't argue with a day that is basically an excuse to eat a doughnut. that husband of mine is rather fond of doughnuts. so, you can imagine how excited he was when i told him that i found a new doughnut recipe that i wanted to try. believe it or not, i'm not a huge doughnut lover. 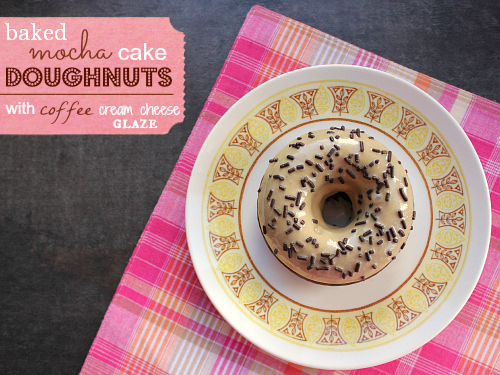 don't get me wrong, i do enjoy an occasional doughnut, but they usually are not my go-to dessert indulgence of choice. however, homemade doughnuts are a completely different story. a completely different story. 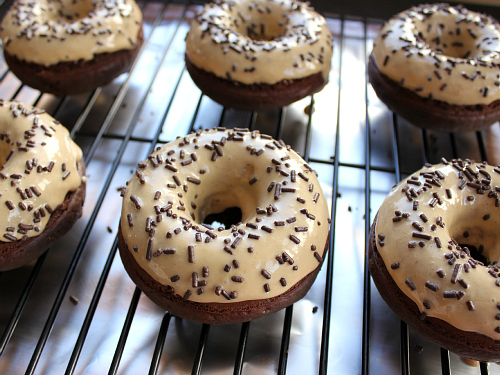 no doubt, coffee and doughnuts are a match made in heaven. so why not combine the two? 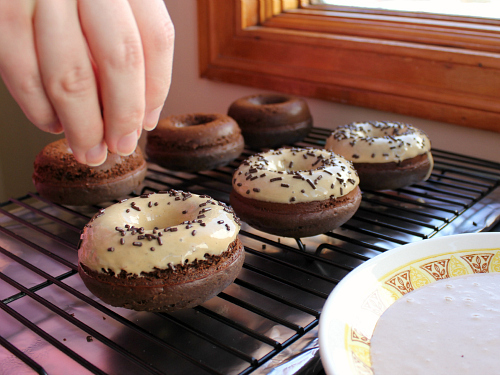 thus, i present to you (on this fausnaught day) mocha doughnuts with coffee cream cheese glaze. really, how can you go wrong with this combination? let me tell you a few things about these doughnuts . . .
first, these doughnuts are baked, not fried. so, i guess you can feel a little bit better about them since they did not take a swim in an oil bath. 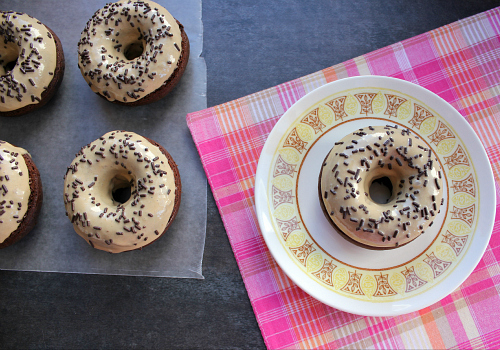 second, these doughnuts are cake doughnuts, not yeast doughnuts. that's not to say that they are dense like the cake doughnuts that you might find in your local doughnut shoppe. oh no, they are ethereally light and fluffy. third, they are topped off with chocolate sprinkles. fact: sprinkles make everything cuter. now . 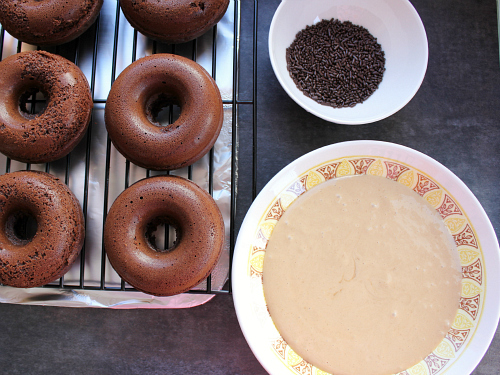 . . yeast doughnuts are easy to make with just a set of biscuit cutters. since they have yeast in them, they hold up well and don't loose their shape. cake doughnuts are another story. 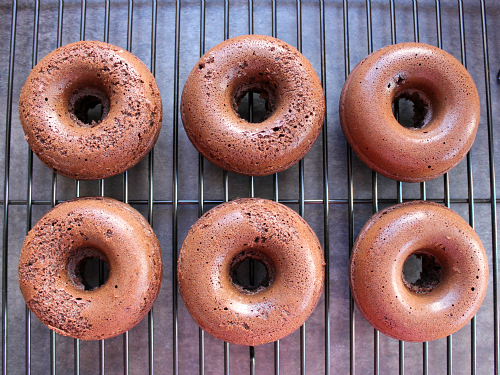 they need a little help from a doughnut pan in order to keep their shape. go ahead, buy yourself a doughnut pan. your life (and your waist line) will never be the same once you do. to make the doughnuts: preheat your oven to 325 degrees F. in a large bowl, beat together the buttermilk, oil, vanilla, egg, and brown sugar with an electric hand mixer. sift the flour, baking soda, cocoa powder, and instant coffee into the batter. beat well, until combined. pour the batter into a resealable sandwich baggie. 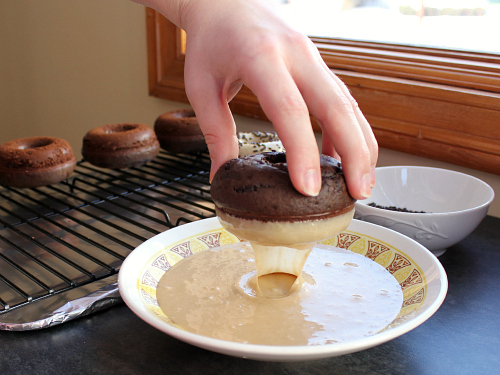 use scissors to cut one of the bottom corners off the baggie, and squeeze the batter into a well-greased doughnut pan. bake for 10 minutes, or until the doughnuts spring back when pressed lightly. 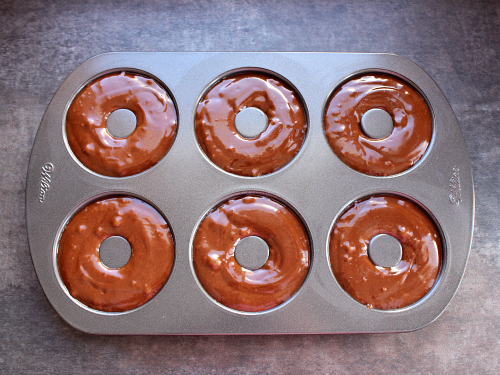 once baked, allow the doughnuts to cool in the pan for 2 minutes, then carefully remove them from the pan and allow them to cool completely on a wire cooling rack. 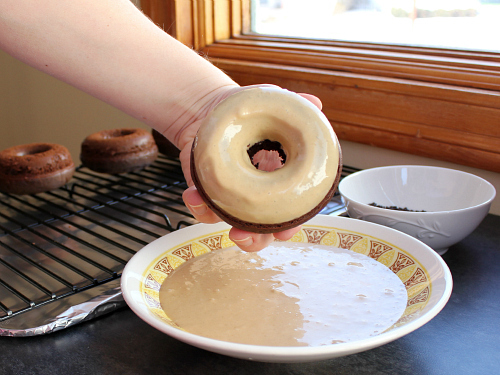 to make the glaze: in a small bowl, stir the instant coffee into the hot water until dissolved. melt the cream cheese in the microwave, and beat the melted cream cheese into the coffee with an electric hand mixer. add the milk, powdered sugar, and vanilla. beat well, until combined. 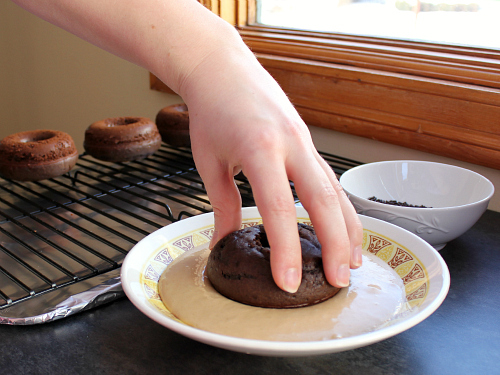 dip the cooled doughnuts into the glaze. place the doughnuts on a wire rack with either aluminum foil or waxed paper under the rack in order to catch the dripping glaze. decorate with chocolate sprinkles. These look like they were made professionally! Very yummy looking! I also like the lettering on the first photo. Wow! how impressive and I want to borrow that pan. I seriously do NOT need a donut pan, but I just might go get one now!! Yummy! PS: Would you mind sharing what font you used in the "mocha"?